During Friday, Bitcoin dropped to or even through its critical support level at around $6000, which it reached on the 6th of February earlier this year as seen in the weekly chart below. What does that mean now? But that doesn’t necessarily mean that it will drop more severely if it penetrates the line of support more clearly. But it could, of course, start dropping faster. It also could manage to bounce back, at least temporarily. The key question here would be, what means temporarily? In any case, after last year’s wonder rally, enthusiasm has now vanished. The big problem for cryptocurrencies is that trading them or investing in them is not only a zero-sum game. No, it is an ironclad negative-sum game. Essentially fresh money from investors has to compensate continuously various “drains”. Miners get coins for their mining and buy hardware and electricity, for which they have to pay real dollars. Exchanges take fees and pay salaries and rent. ICOs sell tokens and develop something of the future, again only with paying their developers salaries with real money. Conference organizers even like to charge real dollars for which crypto-wizards sign up by selling some of their coins. Of course, they also have to pay the costs for their hyper-important event with real money. The point here is, Bitcoin & friends are no real money, at least not now. Some participants of the ecosystem may get revenues paid in cryptocurrencies, some may demand strictly hard dollars, e.g., exchanges, but they all incur costs in real fiat. That means these ecosystem members are all constant coin sellers, which is exactly the additional problem of a bear market in the crypto space. Not only are current holders of coins tempted to sell now and are actually doing that. But all the above listed stake holders and others are also forced to liquidate cryptocoins in order to pay their bills. On top of that the influx of fresh investor money is also decreasing. The lower the mood, the more the idea that Bitcoin and others are actually worth nothing takes over. It may be better to wait for an investment. But how long? In the stock market, during downturns, long-term values of companies stay essentially the same. Stocks are just getting cheaper, for instance, because the economy is in bad condition. But usually that’s a temporary phase. It pays off to buy in a value-oriented manner shares when they are cheap. Warren Buffet has proved that this works for more than half a century. Cryptos are different. As Buffet is not getting tired to point out, they don’t earn anything. They are just there and produce costs. Waiting in the cryptocurrency market may only open the eyes of more bagholders that they are actually clinging to tulip onions. The mood deteriorates even more. At some point newly invested real money cannot compensate the drain any more. Probably we are either already beyond that point or close to it. Does that mean Bitcoin can go only downhill from here on? The crypto market stabilizes and makes a run at the all-time high again. Just because one of the next small recoveries catch enough investing money that waited for exactly that situation. This small seed then would have to grow into a newly formed optimism. Stakeholders manage to decrease their costs, mitigate the selling of coins and the market can recover that way. This is possible but unlikely. There are clearly big stake holders that try to support the market with concerted buy actions or with spreading the right news at the right times. But they would have to act concerted with cost cutting to really address the problem. Prices go further south. At some point some coins look “really” cheap. Likely these are (now) secondary altcoins, successors of Bitcoin & Co, that have better technological properties. E.g., the next generation of digital money could and should be less energy-hungry. The coin-star of the future may not even have been born today. Especially the last scenario, the morphing into new coins, will be interesting and open new investing opportunities in the future. 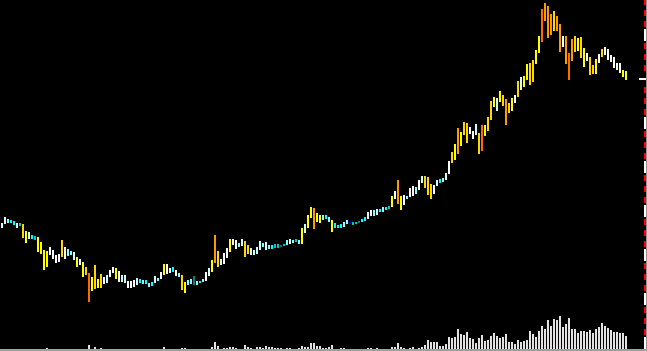 Trading cryptocurrencies is, of course, also in a downtrend possible.